Here’s a fun way for kids to make their own gift bags this year. 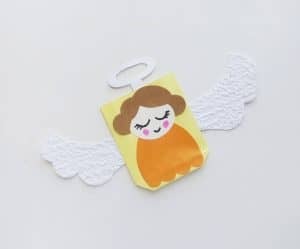 These cute little angels make festive wrapping for any gift. 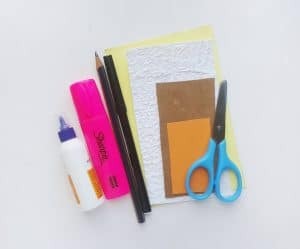 Older kids can even craft their own bag as well, or you can keep it simple and use a brown paper sack for younger kids or to speed up the process! Once the bag is made it creates a great opportunity for giving back as well! Fill it with love as a gift for a teacher, elderly neighbor, or the local homeless shelter. Glue the wings on either side of the bag, on the middle crease of the side folds. Now, glue the dress and the head of the angel on the front side of the bag. Allow to dry a bit before drawing a cute face on your angel! Want to create your own bag? Follow these instructions! 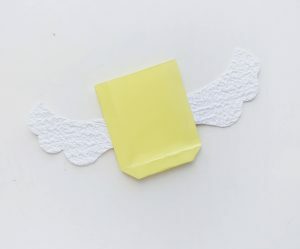 Use a large piece of colored craft paper and cut out a rectangular shape (about 16.5-inch x 8-inch will do). Keep the 0.5 inch intact along any one side of the width; fold the 16-inch in half. 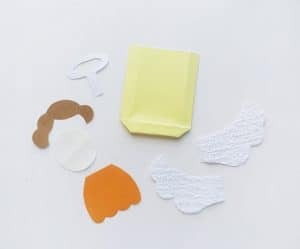 Apply glue along the 0.5 inch part; fold and join the glued part with the other open end of the folded paper. Fold up 2 inches of the folded paper from any one open end. 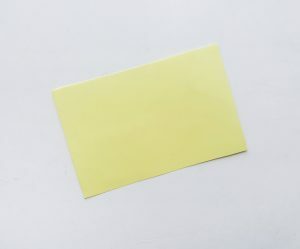 Place the folded paper on a flat surface and open the bottom fold from the middle and flattening the sides; this will create a triangular pattern on both side. Hold any one of the open sides and fold half of it downwards. Similarly, hold the other open side and fold half of it upwards, overlapping the open edge of the previous side. Apply glue along the overlapped parts to secure the bottom of the bag. After completing step 7there will be 2 square parts on both sides of the bottom. Fold along the sides (left and right) of the bag. Match the opposite corners of the squares on the sides of the bottom part to make perfect fold/crease along the left and right side. This will create crease lines on both the front and back side of the bag and a centerline for each pair of creases. It’s pretty cool that you can create your own bag out of a simple piece of paper! 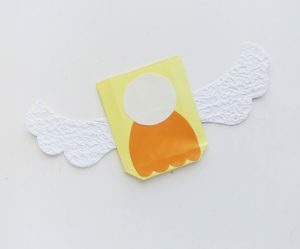 If you like angel crafts check out this Simple & Quick cardboard tube angel craft perfect for toddlers and preschoolers! 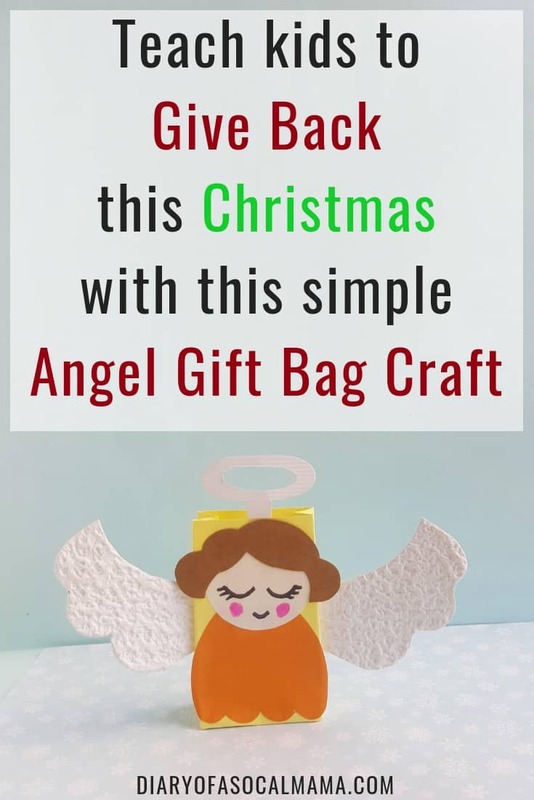 These cute angel bag crafts can easily be turned into a great community service project! The holidays create a wonderful opportunity to start teaching kids to give back to others, not just to get presents for themselves. They can create a gift for their teacher, or even better, for a person who may be lonely this holiday season like an elderly neighbor or homeless individual. I recommend using a brown paper bag if you’re giving to a person in need as you don’t want a self-made bag to break. Otherwise reinforce the bottom of your own bag with extra tape, glue, or some cardstock. A handwritten note, drawing, or printed poem for those too young to write and draw pictures. This can mean so much, especially to those that may be alone over the holidays. Toiletries and small items. For the elderly and the homeless small convenience items are great. Stay away from sweet treats unless it’s for a person you know as they could be diabetic! Now it’s time to deliver your packages. You can drop them on a neighbors doorstep or deliver them in person! Not sure where to gift your bags? Check with a local organization that serves the elderly or the homeless. A local church can also likely point you to a person who is in need of a little extra love this holiday season.